Say Something Nice: CREEPSHOW 2 (1987) | Birth.Movies.Death. Michael Gornick’s 1987 sequel to George Romero’s horror anthology features one of the best vignettes of the entire CREEPSHOW franchise. Five years after George A. Romero’s Creepshow stole the box office’s cold, dead heart, first-time feature director Michael Gornick (Romero’s cinematographer) put together a trio of Stephen King stories, presenting them in the same EC Comics-style format that made the original Creepshow so endearing over the years. However, those involved were unable to ascend to the level of quirky horror movie magic that Romero and King had created the first time around. Creepshow 2 features only three segments (“Old Chief Wood’nhead”, “The Raft”, and “The Hitchhiker”) instead of five like its predecessor, and together those three are fairly underwhelming in comparison. But the stories get stronger as the film ambles along its 92-minute runtime, so if you can get through the first story, you’re then rewarded with some solid tales of terror. No one claims “Old Chief Wood’nhead” as their favorite segment. No one. Anyone who says they do is a narc. A decorative cigar store statue of an indigenous chief taking revenge on behalf of his slain elderly store owners sounds fairly rad, but it just doesn’t pan out that way. While the segment features some memorable scenes of scalping, it’s no Maniac. Its biggest flaw is the tragic mood it strikes throughout, making it tonally incongruous with the rest of its Creepshow brethren. The general consensus seems to nod in the direction of the second segment, “The Raft”, as the greatest story of the three. And it’s certainly a good one; a group of blazed-out, sexed-up teens go for a dip in a lake (passing the “Restricted Area” sign along the way) and encounters a ravenous, sentient oil slick…thing. I still cringe at the celery-snap crack of one boy’s femur as he’s pulled through the slats of the raft that serves as the teens’ only refuge from a gruesome death. “The Raft” is a good’n. But I’m here to advocate for “The Hitchhiker” as the raddest entry in the film. Preceding hit-and-run slasher film I Know What You Did Last Summer by a decade, “The Hitchhiker” follows Annie Lansing (Lois Chiles) as she hurriedly returns home from her latest extramarital fling in order to keep up appearances with her wealthy, unsuspecting lawyer husband. A simple mistake leads to deadly consequences as she drops her cigarette into her lap and takes her eyes off the road. In a flurry of screeching tires and bloody thumps, Annie goes and plows her fancy car into a sign-carrying hitchhiker on the side of the road. Shady is as shady does, so Cheatin’ Annie flees the scene, making it an official hit-and-run. She turns off her headlights so that the passing Stephen King cameo can’t identify her as she drives away from responsibility. She then tries to figuratively wash the guilt away with a bloody swipe of her windshield wipers, and tune out the problem with a crank of the radio. The usual voiceover narration is replaced with Annie thinking out loud and trying to justify her crime to the courtroom in her conscience. Then the hitchhiker shows up again, waving that floppy “Dover” cardboard sign at her. We’ve seen the core story countless times throughout history, from Poe’s “The Tell-Tale Heart” to the bizarre “You Drive” episode of The Twilight Zone (with the notable distinction of the car itself taking revenge on behalf of the hit-and-run victim). Throughout, it’s often unclear whether the antagonistic protagonist is being tormented by an actual ghoul or if it’s simply a visceral personification of their own staggering shame. Here, “The Hitchhiker” does what its predecessors have done, keeping the audience guessing as to whether the Dover-bound dead man is 1) actually dead and 2) not just in Annie’s guilt-ridden head. The hitchhiker makes contact with Annie several times, even smearing blood on her lily-white L.L. Bean blouse. That smear is noticeably missing in the segment’s final shot of Annie, lending credence to the insistence of a supernatural element to her comeuppance. While most of these guilt-as-monstrosity stories are heavy on the Gothic dread but remain relatively bloodless, “The Hitchhiker” ratchets up the gore with the great Greg Nicotero’s (under consultation from FX heavyweight Tom Savini) practical effects. The hitch-hiker’s face is increasingly obliterated by Annie’s efforts to make the problem go away until we ultimately witness a blood-soaked skull, devoid of skin, wagging its dangling tongue against Annie’s screaming face. Chiles (whom you may remember as Moonraker’s Dr. Holly Goodhead) and her fabulous triangular haircut turn in a fantastic performance that goes exponentially over-the-top to compete with the horrifying absurdity of the Victim-That-Won’t-Die. 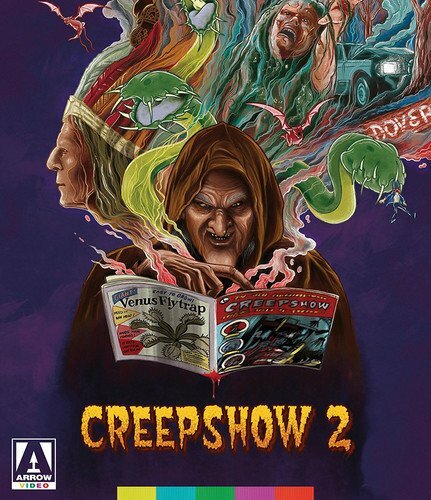 While it’s no Creepshow, Creepshow 2 easily stands tall among horror anthology films, largely due to its final 25-minute vignette highlighting the crushing weight of Rich White Lady Guilt. 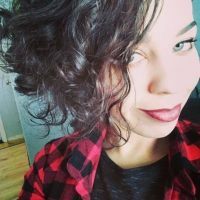 Anya Stanley is a California-based freelance writer and staunch Halloween 6 apologist. Her horror film analyses have appeared on Vague Visages, F This Movie!, Daily Grindhouse, and wherever they'll let her talk about scary movies. Follow her shenanigans on Twitter @BookishPlinko.